Jewish Home officials accuse Netanyahu of betraying voters on the right, after Lapid claims he was offered ministries held by Jewish Home. 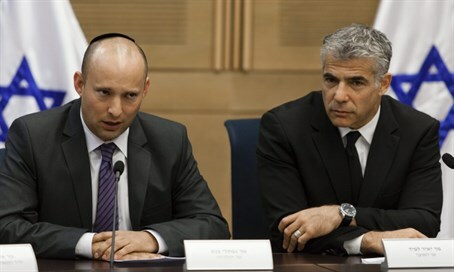 Officials in the Jewish Home party on Saturday night accused Prime Minister Binyamin Netanyahu of “betraying” voters on the right, after Yesh Atid chairman Yair Lapid said in a television interview that the Likud had offered his party the ministerial portfolios currently held by Jewish Home. Speaking on Channel 2 News’ “Meet the Press” program, Lapid claimed, "In the past week we had a few offers. They came to Yaakov Perry and offered the portfolios of Foreign Affairs, Justice, Agriculture and Education - I wonder which party they belong to." "We said no," he continued, "because I cannot represent a policy - I wanted to say a policy in which I do not believe, except that I don’t know what the policy is, and no one else knows either." Responding to the remarks, Jewish Home officials said, "We are not afraid of the opposition. Going to the left to form a government is breaking a promise to voters on the right. It is betraying the voters on the right." "The Jewish Home would know how to be a proud fighting opposition if it had to," the officials stressed.